A small business that needs to transmit high-quality fax messages requires a speedy and well-built device like the Canon L160, a standalone fax that is integrated with super G3 features plus an ADF and copy function. 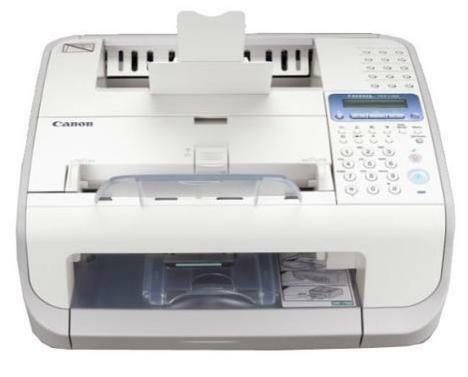 The Canon i-SENSYS FAX-L160 is great for bulk messages because of the 150-sheet paper capacity, while one-touch speed dials allow users to save time and effort in sending the messages. Unfortunately, the Canon L160 printer lacks some functions that could have made it more useful as a fax machine. This lightweight and compact device weighs approximately 8kg and measure 400mm wide. The i-SENSYS L160 laser printer may require more room for installation that measures 780mm deep and 684mm wide when the trays and optional handset are integrated. Canon provided a laser beam printing engine for this super G3 fax printer which is capable of speeds of up to 14ppm and high resolutions of 1200x600dpi. The main control panel lies on the top right-hand corner of the Canon L160 laser fax, and it features a small LCD screen. The Canon i-SENSYS L160 fax machine boasts print functionality and speedy fax/copy functions at up to 12ppm or cpm. Print resolution is up to 600x600dpi, so text looks good. The fax memory is up to 340 pages while security features include system management password, confidential transmission, reports, and direct mail prevention. The telephony features of the Canon L-160 are impressive with the fax/tel auto switch, auto redial, and one-touch speed and coded dials. The handset for the Canon i-SENSYS FAX L-160 is an optional component that needs to be purchased separately, which means additional costs. Apart from that, the L160 fax printer lacks an answering machine, a caller ID function, a hold key, and a speaker phone. Operating the Canon L160 fax machine can be overwhelming for first-time users because of the busy control panel and the small display screen. Internet fax is not supported by the L160.